North Carolina Fishing Charters !! North Carolina offers some of the best big game fishing in the world and Over Under Adventures is right in the middle of the action. This winter, you'll find us fishing for the largest tuna of them all, the GIANT BLUEFIN, charter fishing out of Morehead City, NC and Cape Hatteras. For your North Carolina Fishing Charter, please call 866-OUA-TUNA! NC Giant Bluefin Fishing Charters! Come Fish with Over Under Adventures for the largest Tuna of them all, the Giant Bluefin. Giant Bluefin an be targeted out of North Carolina beginning in December each year and are typically around till sometime in March. The entire outer banks of North Carolina offers great chances at BIG Bluefin, Yellowfin, and Big Eye Tuna. Later in the Spring, we will begin to catch more Dolphin, Marlin and Wahoo as well. We hope you'll come and join him and the rest of the OU crew for this once in a lifetime opportunity. Whether fishing Morehead City, Cape Hatteras, or anywhere along the outer banks of North Carolilna, you chances for a memorable trip are quite good. We run a beautiful 55' Custom North Carolina built Sportfish. Twin diesel engines, plenty of speed and a luxurious air conditioned salon, are just some of the features of LOW PROFILE, our North Carolina Charter Boat. 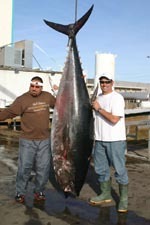 VIEW OUR GIANT BLUEFIN PHOTOS! 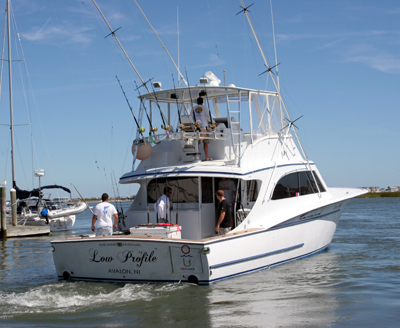 VIEW OUR MOREHEAD CITY FISHING REPORTS! Giant Bluefin Tuna Fishing Video - 2 Fish up to 620#! The boat is docked at Portside Marina, on your right hand side of Arendell St. as you are driving through MHC. Their phone number is: 252 726-7678. 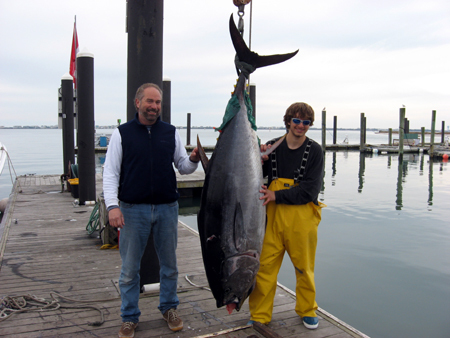 Please call today for your MOREHEAD CITY FISHING CHARTER at 1-866-OUA-TUNA (682-8862)!